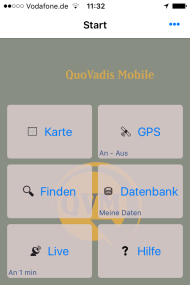 - New, QuoVadis Mobile V3 for Android and iOS now navigate with Offline-OSM maps. It took a long and troublesome development time to build the performant file format and routing abilities for converting those free OSM Data into. 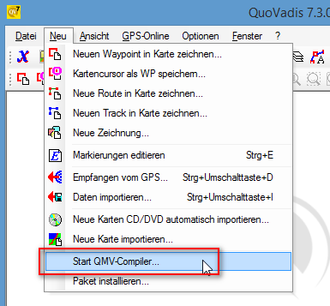 A suitable compiler could be integrated as a new tool in QuoVadis 7.3 You simply download the desired packages in OSM *.pbf file format from GEOFABRIK GmbH or planet.OSM (freely selectable areas), start QV7.3, open QV7.3 compiler at "New", "Start QMV Compiler". 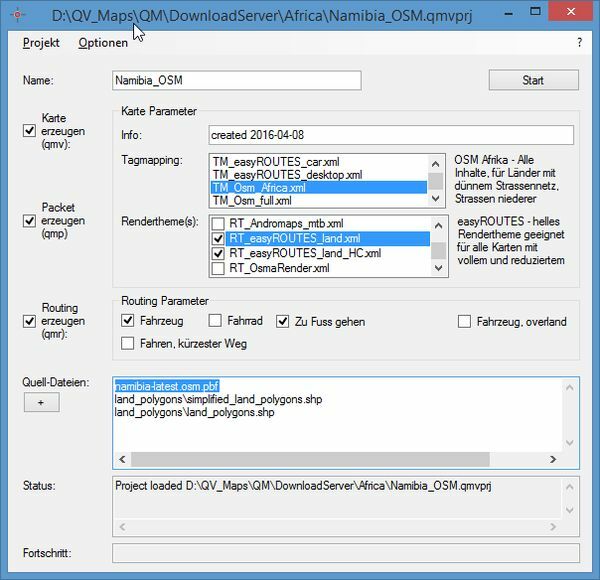 Furthermore we offer download and installation of readily compiled OSM map-packets directly from within QV7.3 - Xplorer. Our goal is to expand the range of maps you find there now. 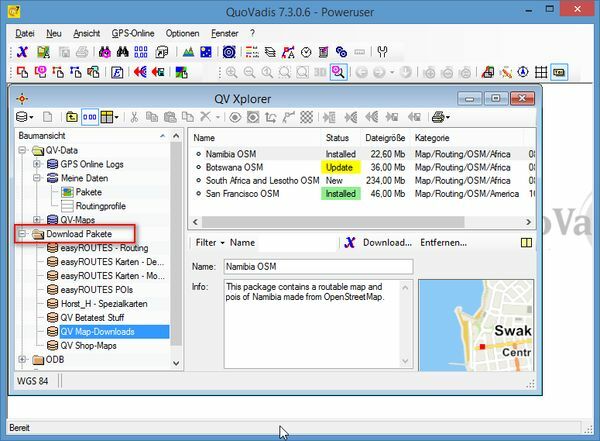 QuoVadis 7.3 is capable of exchanging data with many popular navigaion devices from Garmin and NEW also TomTom Rider and Becker Mamba. The transmission happens simply by using the well known buttons im QV-Xplorer "send to GPS / receive from GPS", devices are recognized automatically or may be preselected in the respective dialogue. You may transmit waypoints, routes and tracks, wherein the devices may differ in their abilities to handle the transmitted information. Google engine, as well as the Bing Engine. 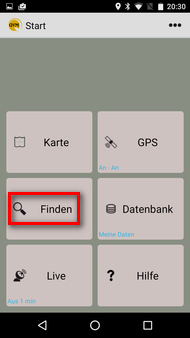 version 3, directly available through playstore from Google and iTunes von Apple, each at a price of 4,99€. These new apps can import those newly introduced QMV maps and routing data and are thus independent from any internet connection on the road. 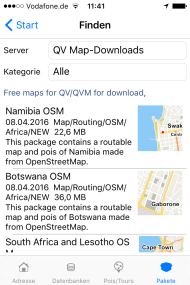 You may download and install those OSM map packages directly from withing the app, which are available for QuoVadis 7.3 too. 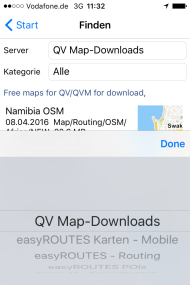 To do so, you enter "finder" on QVM starting page, select the tab "packets" and can choose now from different server-sources for readily compiled map packages. Simply select the desired package and start downloading and installation. 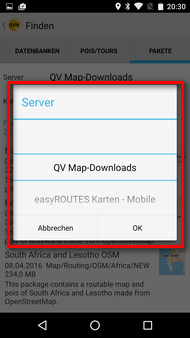 You may also create your own QMV-offline-OSM map packages using QuoVadis 7.3 compiler as mentioned above. QVM-iOS V2 customers will get QVM-iOS V3 automatically as a free upgrade using iTunes. QVM-Andoid V2 customers have to purchse QVM-Andoid V3 anew using Google playstore. The current app QuoVadis Mobile Windows Phone V2 is now available at Microsoft Appstore for free. relaxing time using QuoVadis7 and QuoVadis Mobile!